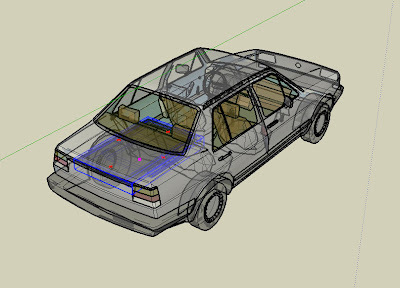 SketchUp Fanboy: Surprisingly Useful: Will The Plasma TV Fit In Our Car? Surprisingly Useful: Will The Plasma TV Fit In Our Car? When my well-to-do friend wanted to upgrade his 50" plasma TV from 720 to 1080 (my eyes can't be that refined - I still can't see the difference) he offered me his old one for a fifth of the retail price. How could I pass it up? My only issue was how to get it home. This was more than a year ago when my SketchUp skills were developing and rudimentary. But better modelers than me generously share their models on the 3D warehouse. A few minutes searching located a detailed model of my wife's old car (there was no way a 50" plasma TV would fit in my two-seater roadster, although, I did move an Ikea desk with it that was bigger than the whole cockpit but that's a whole different story that still frightens me when I think about it). A few minutes more on the warehouse and I had a generic flat screen TV that I could scale to the exact measurements listed on the Pioneer web site. Even with my basics skills I could then virtually check that the TV would fit in the car before I turned up at my friend's house in real life with the confidence that I had the tools for the job. SketchUp proved its value again for answering a real world issue quickly and effectively.